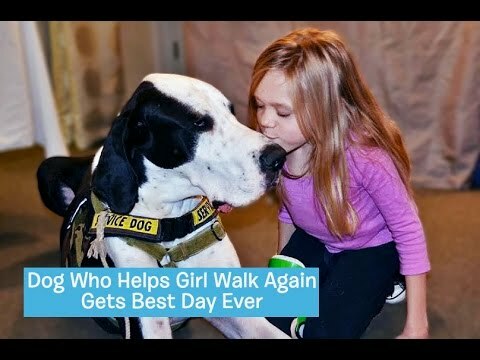 Great Dane service dog, George, and his 11-year-old human, Bella, have captured the attention of people all over the country with their heartwarming and inspirational story. Bella suffers from a rare disorder known as Morquio Syndrome and thought she’d spend her life on crutches or in a wheelchair. All of that changed when she found George thanks to the non-profit Service Dog Project! After volunteering with the organization for a year, Bella finally found the right match in George. Now, the two share an inseparable bond and thanks to her work with George as her mobility service dog, Bella’s newfound independence doesn’t stop at walking – she can even ride a bike for the first time in her life!